Hydraulic Power Pack, HILTI DLP 30 : 2 Nos. Hydraulic Saw Head, HILTI DSTS 30 : 2 Nos. Hydraulic Hoses (set of 6 hoses) : 2 Nos. Remote Control : 2 Nos. Coring Machines HILTI DD250 : 2 Nos. Drilling Machines HILTI TE 2 : 2 Nos. Diamond Wire : 1 No. The following procedure describes the major tasks to be performed. It is the responsibility of the Project Personnel to ensure that all relevant procedures are closely adhered to, work is performed by qualified, experienced and well-trained personnel, and to coordinate all work activities with the concerns. This is a vibration free method of cutting. The area will be cleaned; all surplus materials shall be removed from site. Proper scaffolding will be erected around the column to facilitate the proper access of the work force. The area will be barricaded to avoid unnecessary entrance of non concern people. 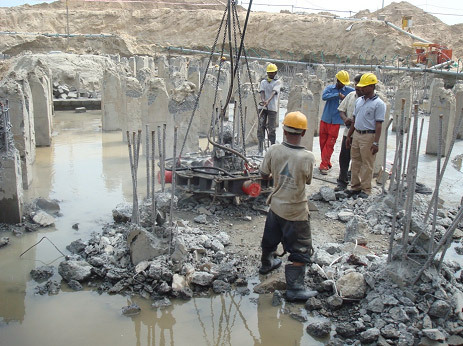 All the necessary machines and equipment will be installed, following the procedures involved in coring and demolition / cutting the concrete Columns. The column will be cut above from 1.5m. Prior to start cutting, the marking will be done on the existing concrete Columns. The column will be cut 150x150x150 one meter down from top from all edges to fix the bow shackles for holding the column with tower crane. Pulleys for guiding diamond disk / blade will be installed. After installation of pulleys, a rail and saw head will be fixed (this saw head will be connected with hydraulic power pack through hoses) and diamond disk / blade will be fixed. It is imperative to cut the piece accurately as per structure and weight condition. The size of the diamond cutting disk / blade depends upon the section of the column. For 600×600 and above size of columns. It will be cut in two portions. Up to half depth will be cut from one side, then the cutting machine will be shifted to the other opposite side of the column and the same procedure will be repeated. During the cutting process the column will be held by the crane with the help of web belts. After cutting completion the piece will be lifted by the crane and removed from the site. This is a vibration free method of RCC cutting. The continuous supply of water on the wire saw, keeps all the operation cooled and without any heat generation. The friction of diamond to steel has no sparking of ignition and the wet operation safeguards all particles produced by cutting to be cold. All operation is remote controlled and far from direct human contact. All the operation will be completed under strict safety supervision. The remaining portion (1.5m) will be cut with hilti machine to get the required splice length.